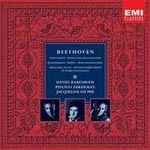 BEETHOVEN : PIANO TRIOS &c.
Trio for Piano and Strings no 10 in E flat major, Op. 44 "Variations on an Original Theme"
Trio for Piano and Strings no 7 in B flat major, Op. 97 "Archduke"
Trio for Piano and Strings no 5 in D major, Op. 70 no 1 "Ghost"
Trio for Piano and Strings no 6 in E flat major, Op. 70 no 2 Trio for Piano and Strings no 11 in G major, Op. 121a "Kakadu Variations"
Sonata for Violin and Piano no 5 in F major, Op. 24 "Spring"
Sonata for Violin and Piano no 9 in A minor, Op. 47 "Kreutzer"